Originally developed by OFI, the whitening cream lightens and whitens the skin’s colour fighting the pigmentary disorders. 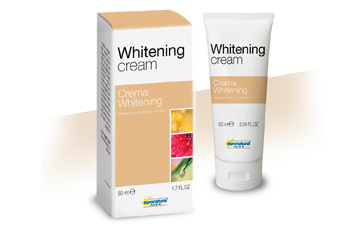 The whitening day cream SPF20 will erase skin hyper pigmentation caused by an excess of melanin. It contains the exclusive whitening complex, a new natural skin whitening blend obtained with a patented extraction method from the most traditional italian cultivar of Sicily Island ( capers, oranges, olive, and rice varieties ). The treatment reduces melanin pigmentation by tirosinase inhibition and by chelation of metals at the level of melanocytes, promotes desquamation in the superficial horny layers and the melanin pigmentary residues contained therein and decreases, day by day, the pigmentation of the skin. UVA/UVB sunscreen ingredients protect against the sun damage. Visibly lightens the complexion when used as an intensive one-month treatment. Finally the skin is refined and becomes softer and smoother.